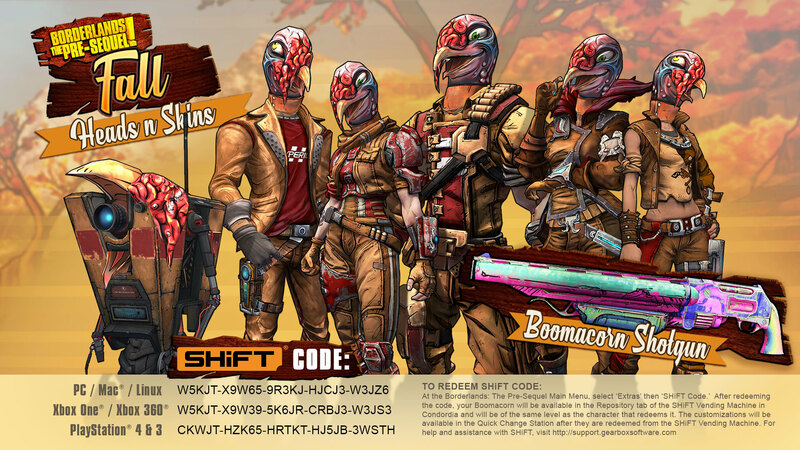 Thanksgiving is coming and Gearbox Software is celebrating this event with some new SHiFT Codes. Beware of the wrath of the Wattle Gobbler because the Borderlands 2 Thanksgiving themed Heads & Skins are coming to Borderlands the Pre-Sequel. Use one of these Shift Codes and channel your inner Wattle Gobbler. These fall customizations are one of the craziest heads i have seen in Borderlands: The Pre-Sequel! Bonus: You also get the a Boomacorn shotgun!